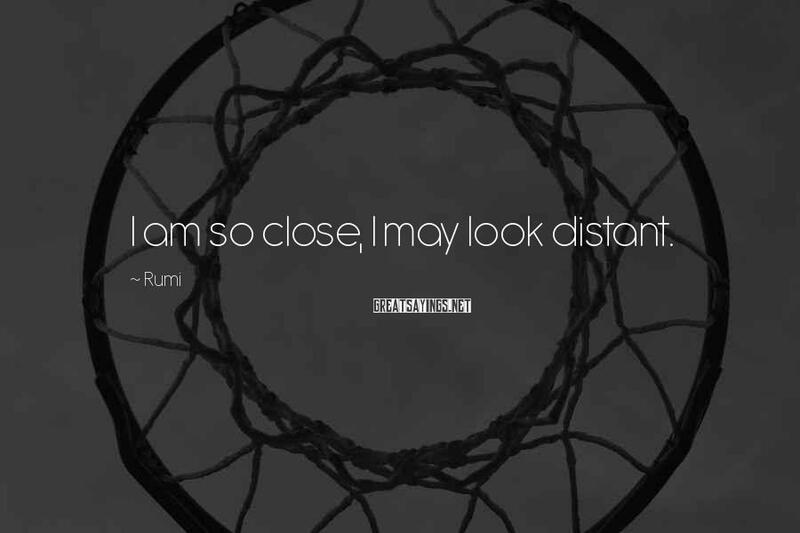 100 Rumi Famous Sayings, Quotes and Quotation. Things are such that someone lifting a cup, or watching the rain, petting a dog, or singing, just singing - could be doing as much for this universe as anyone. 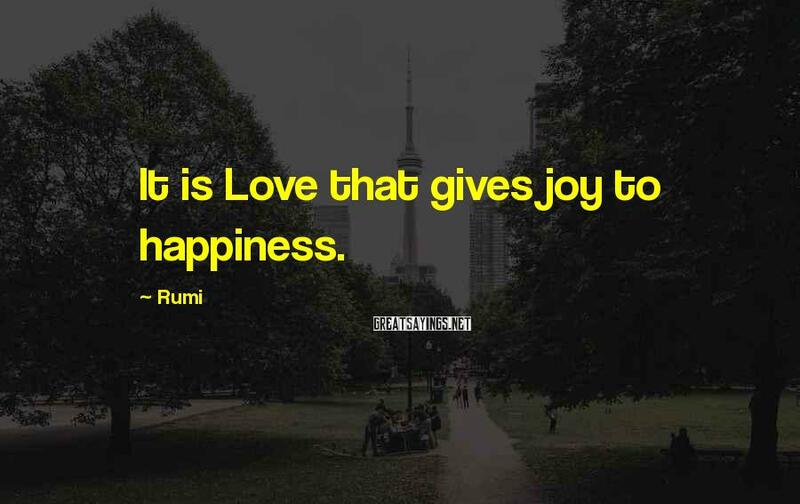 about love and the way. they were not judging his handsomeness. cutting their hands as they cut their food. 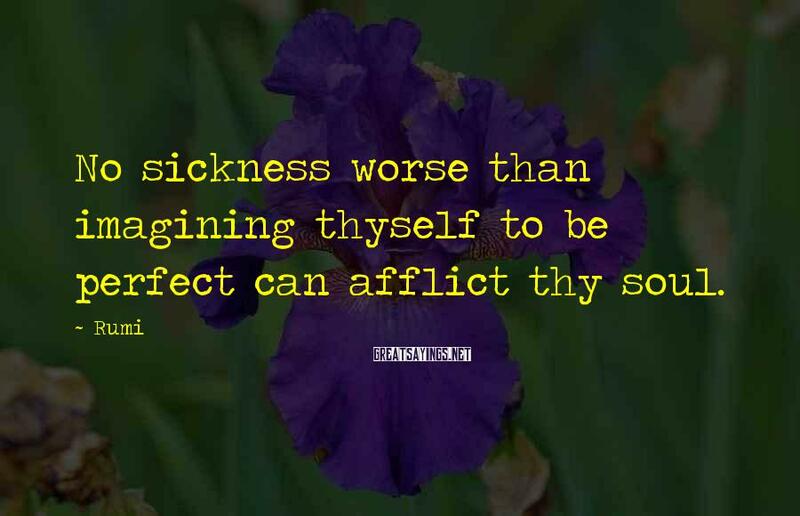 Words can fertilize space now and then; don't deny yourself becoming enriched. 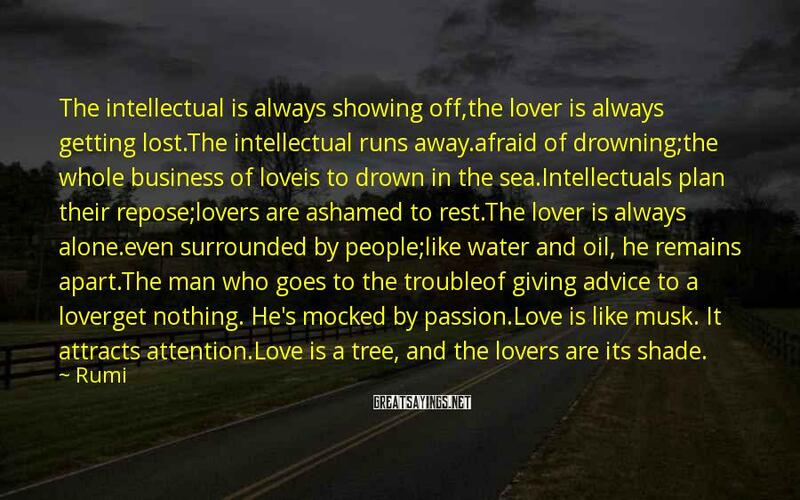 In the sea of love, I melt like salt, Faith, Doubt - they both dissolve. 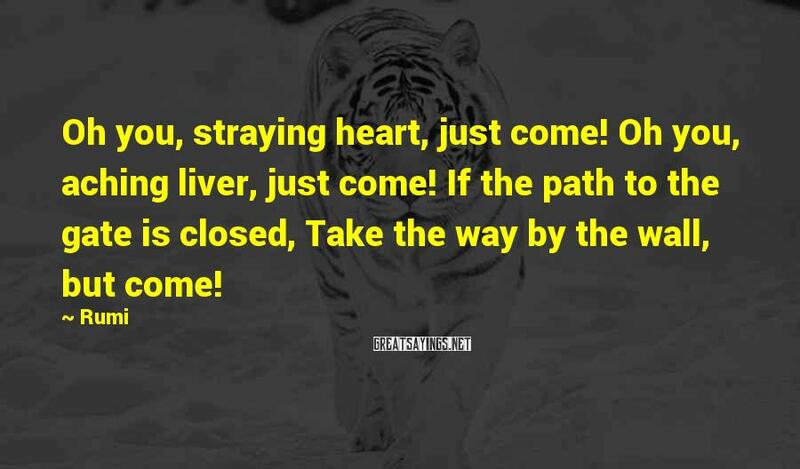 A star is opening in my heart, The worlds turn in it. I want your sun to reach my raindrops, so your heat can raise my soul upward like a cloud. 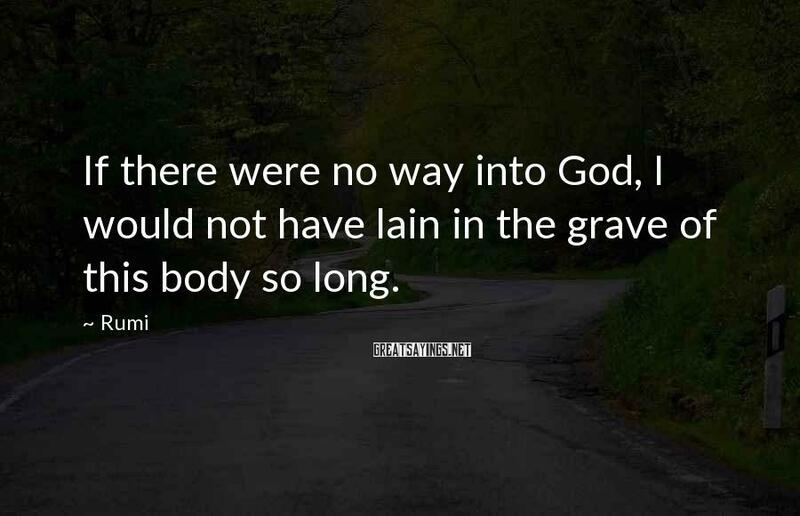 We are tasting the taste of eternity this minute. become that many, you're nothing. Empty. 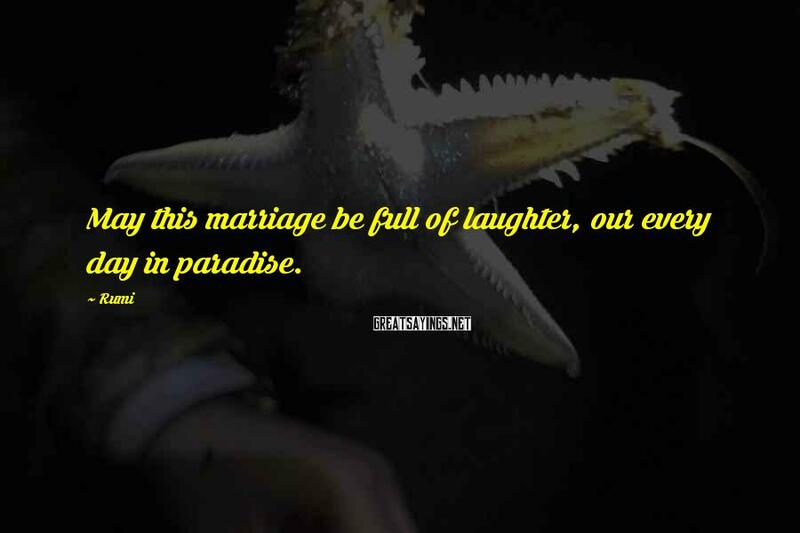 I will find new meaning in every joy and sorrow. 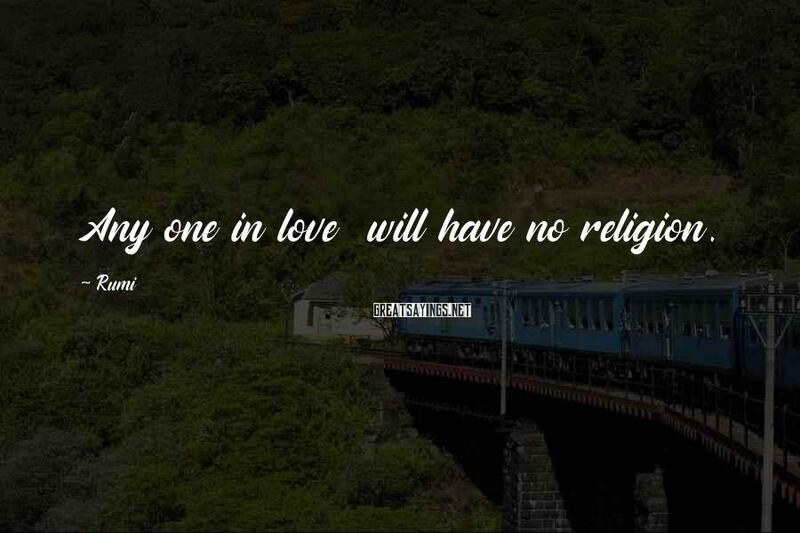 Do not believe in an absurdity no matter who says it. to a far away distant Place of great beauty and tranquility. 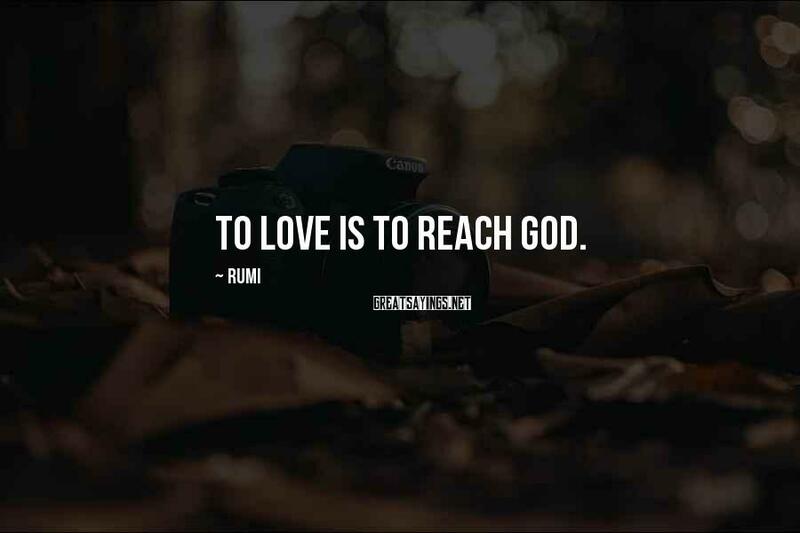 where our Love interwines with Love for all things. In each moment the fire rages, it will burn away a hundred veils. 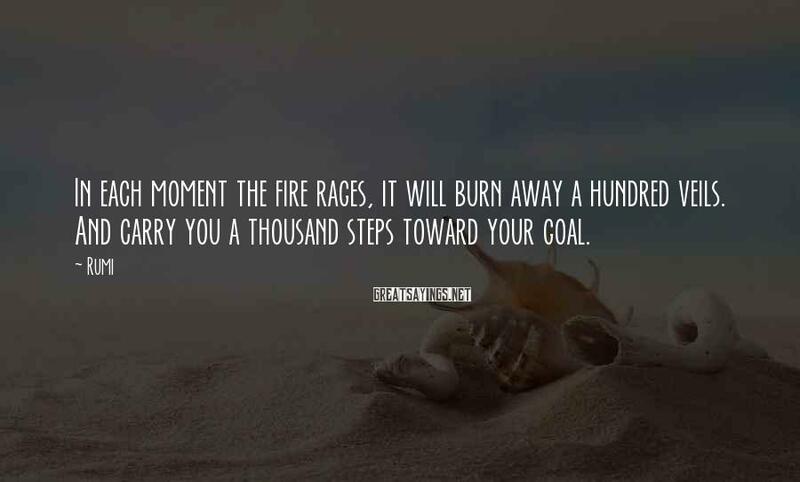 And carry you a thousand steps toward your goal. 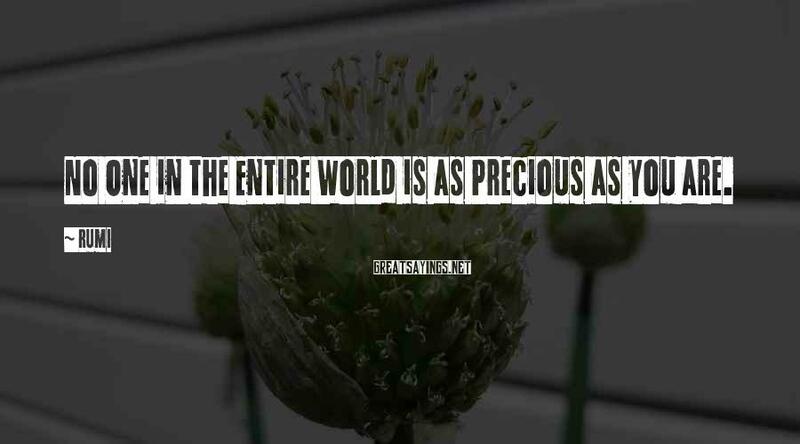 No One in the Entire World is as Precious as You are. Fine honeyed lips and sweet talker. 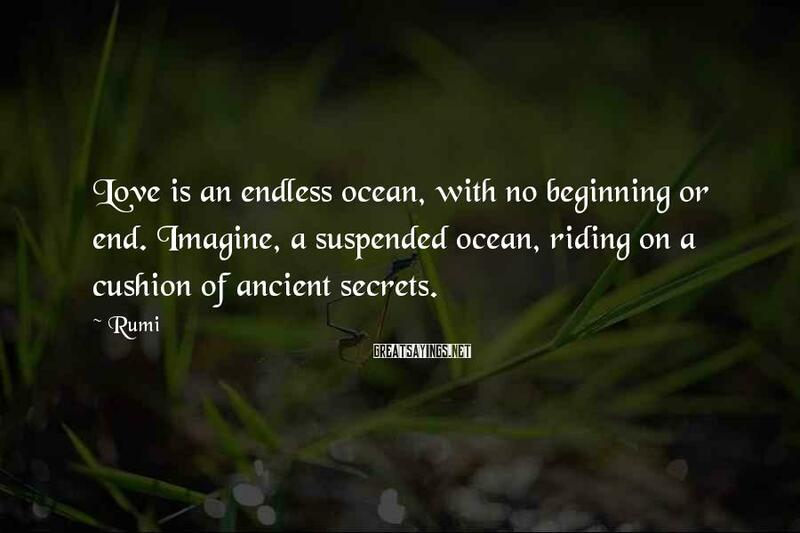 Love is an endless ocean, with no beginning or end. Imagine, a suspended ocean, riding on a cushion of ancient secrets. 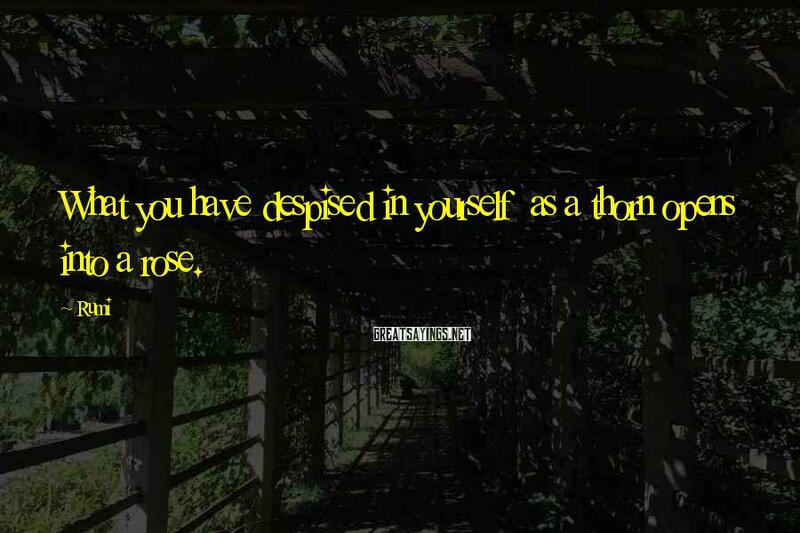 as a thorn opens into a rose. 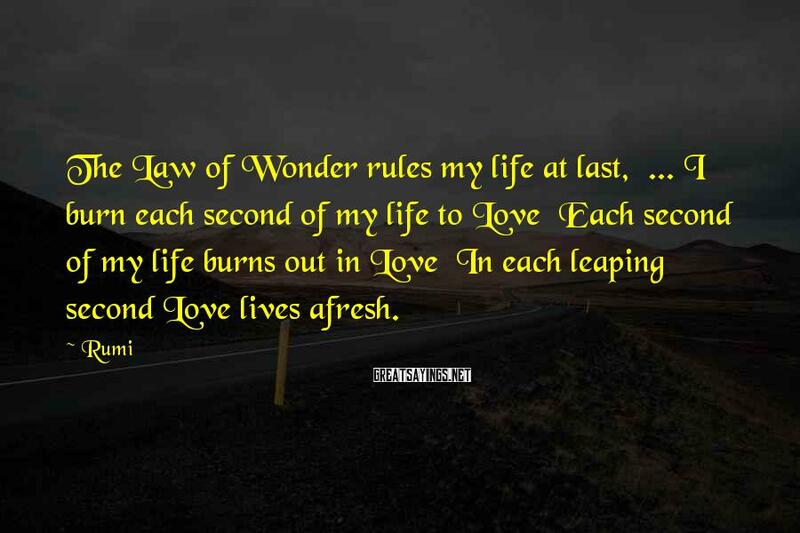 In each leaping second Love lives afresh. 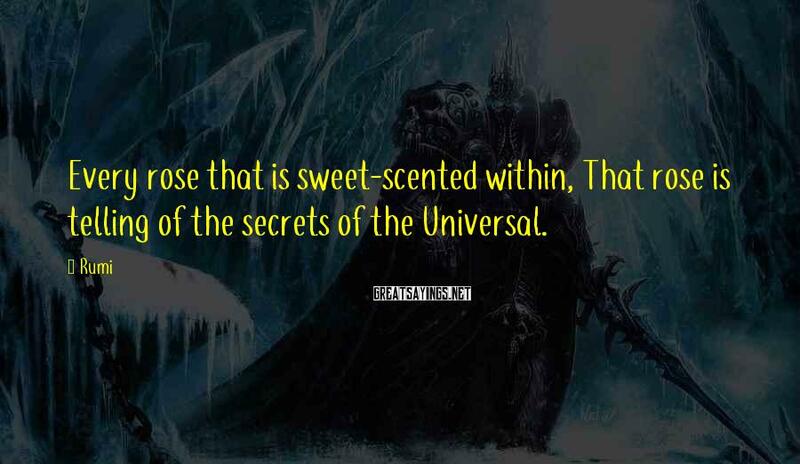 Every rose that is sweet-scented within, That rose is telling of the secrets of the Universal. 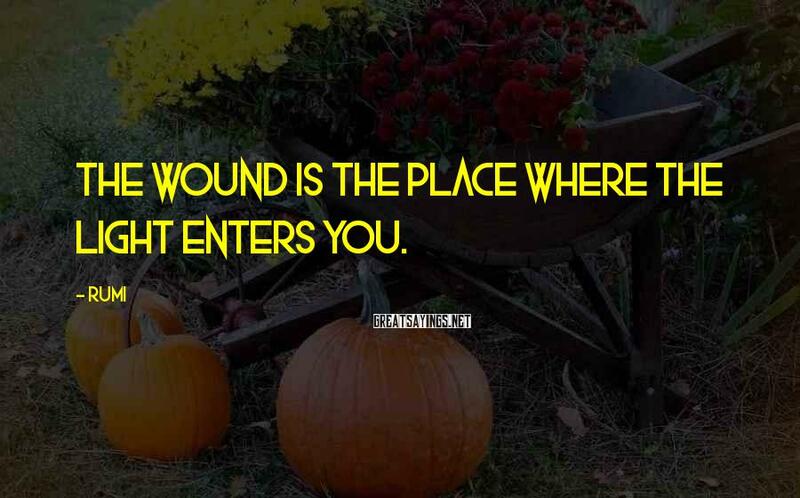 Inside of us, there's a continual autumn. 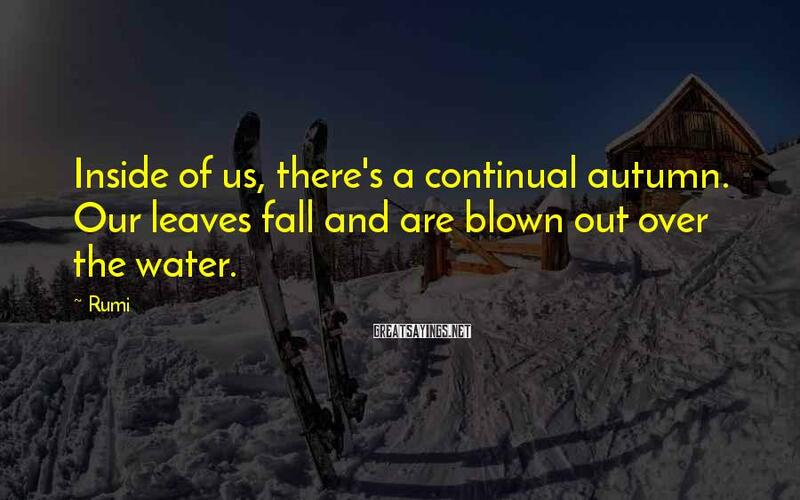 Our leaves fall and are blown out over the water. 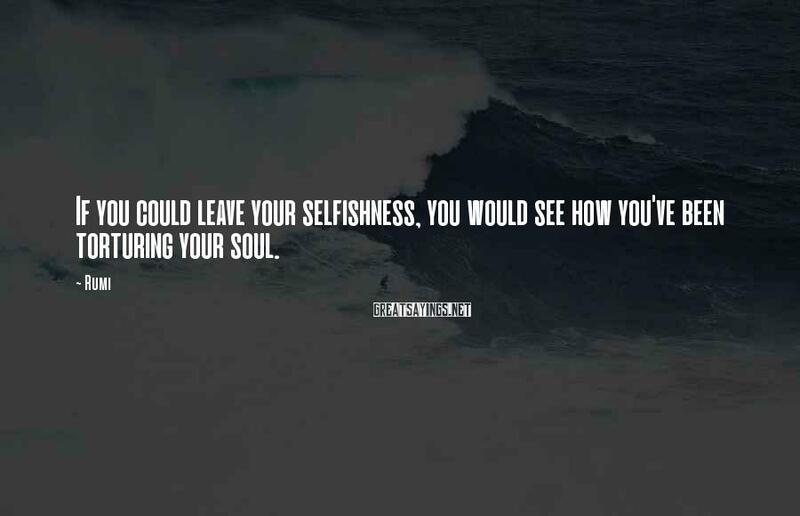 If you could leave your selfishness, you would see how you've been torturing your soul. 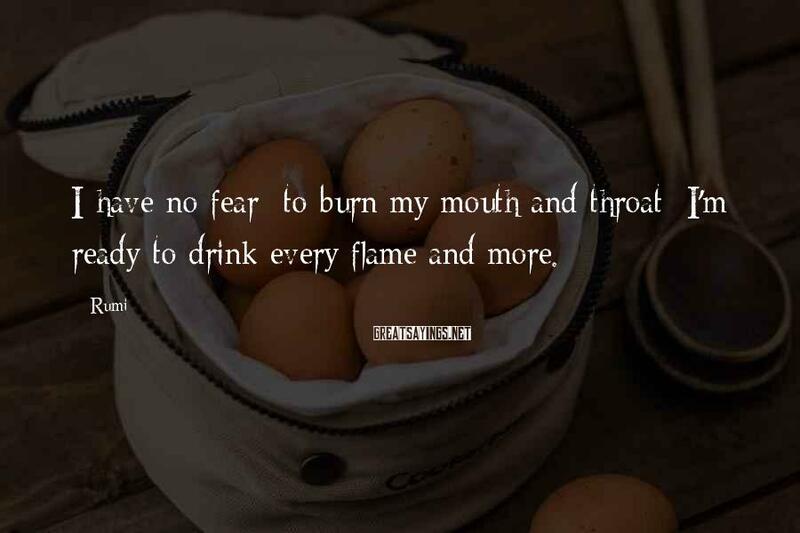 I'm ready to drink every flame and more. 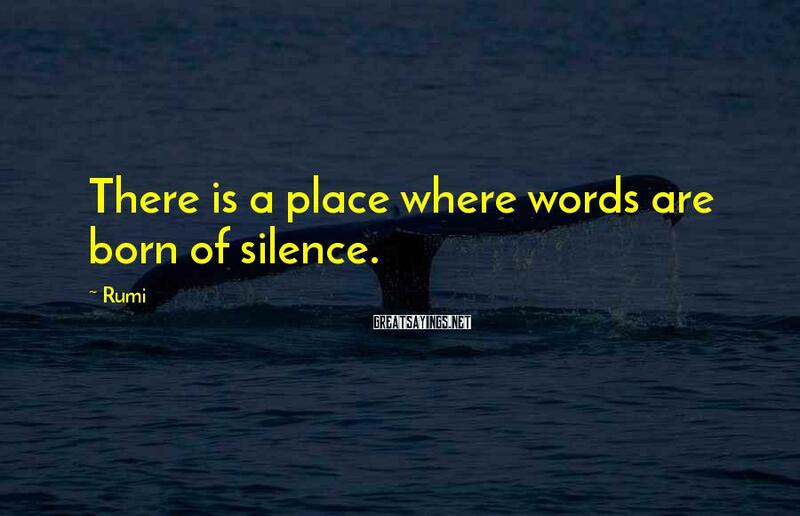 Be silent now. Say fewer and fewer praise poems. 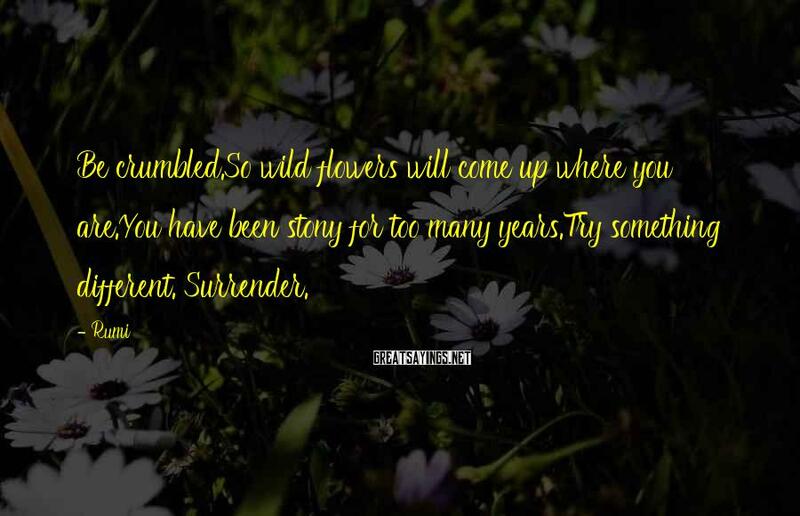 Let yourself become living poetry. 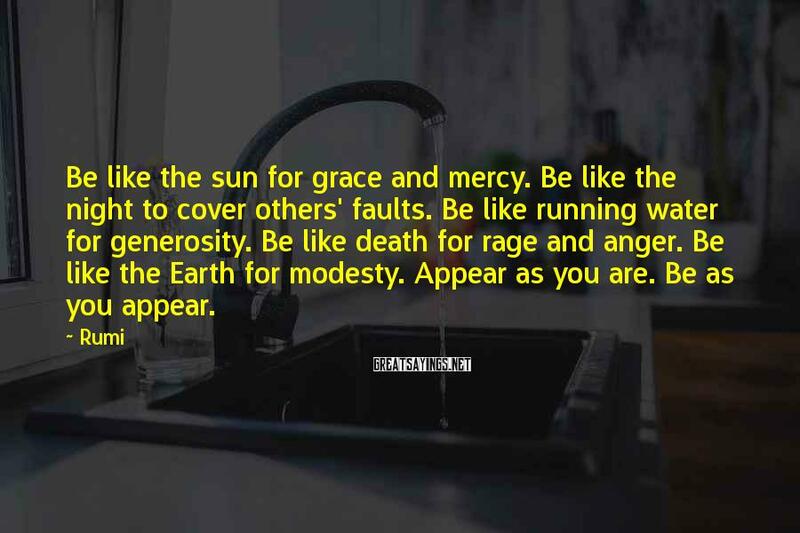 You are the source of the sun. 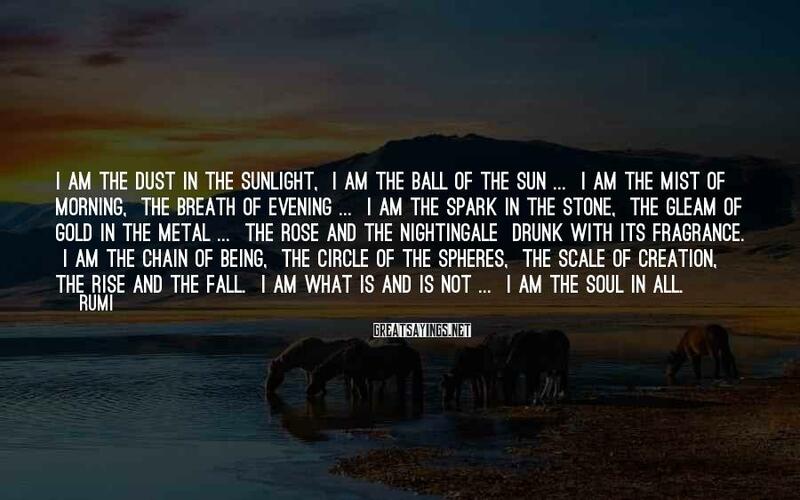 And I am the willow's shadow. 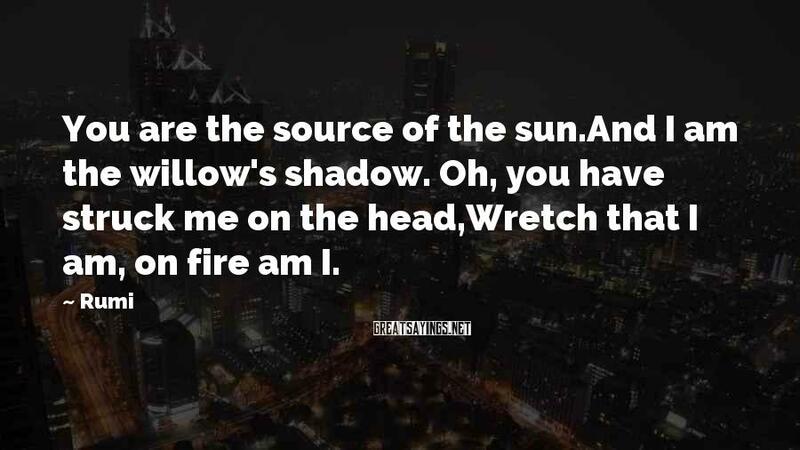 Wretch that I am, on fire am I. 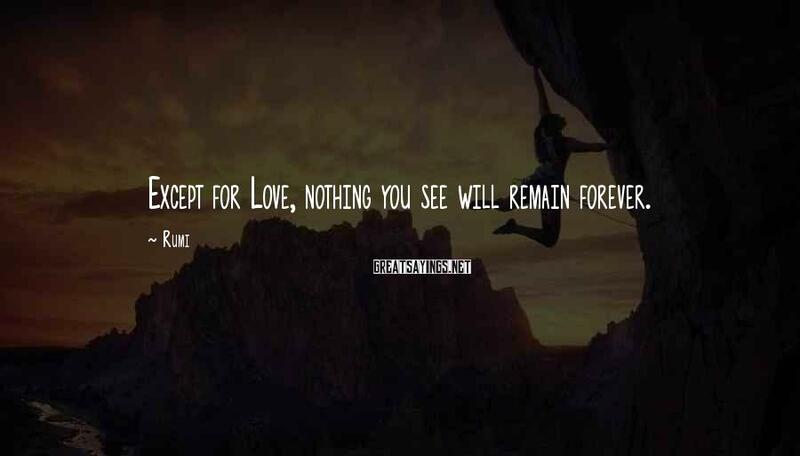 Except for Love, nothing you see will remain forever. 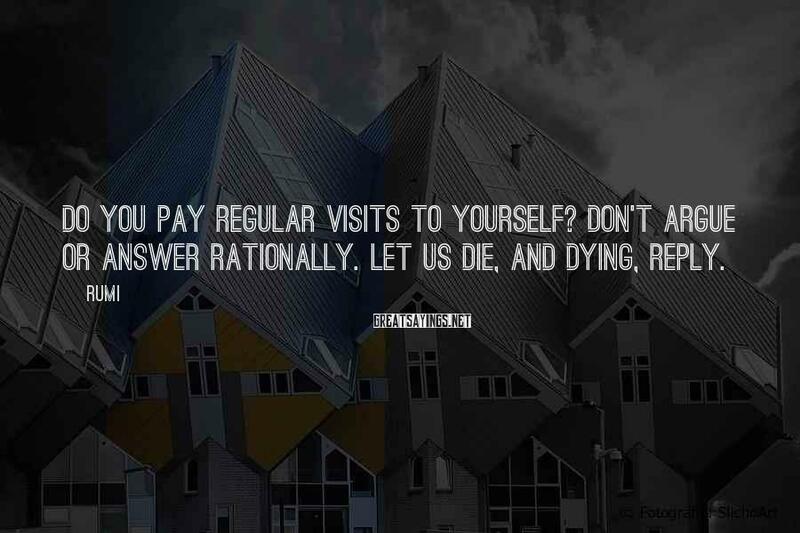 Do you pay regular visits to yourself? Don't argue or answer rationally. 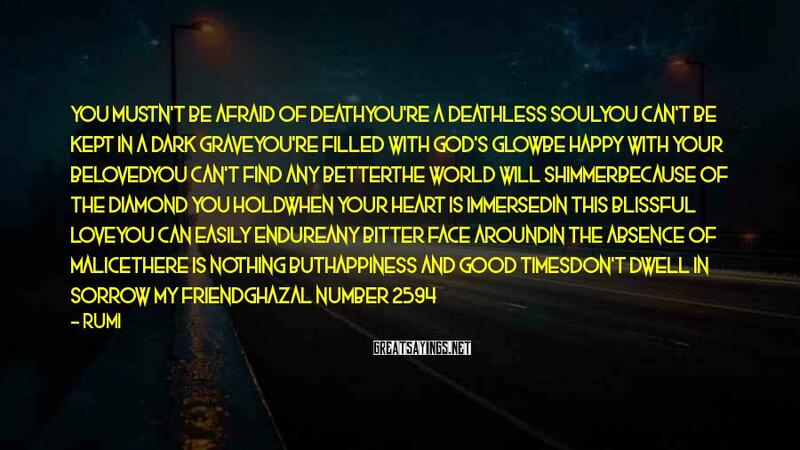 Let us die, and dying, reply. Since I was cut from the reedbed I have made this crying sound. 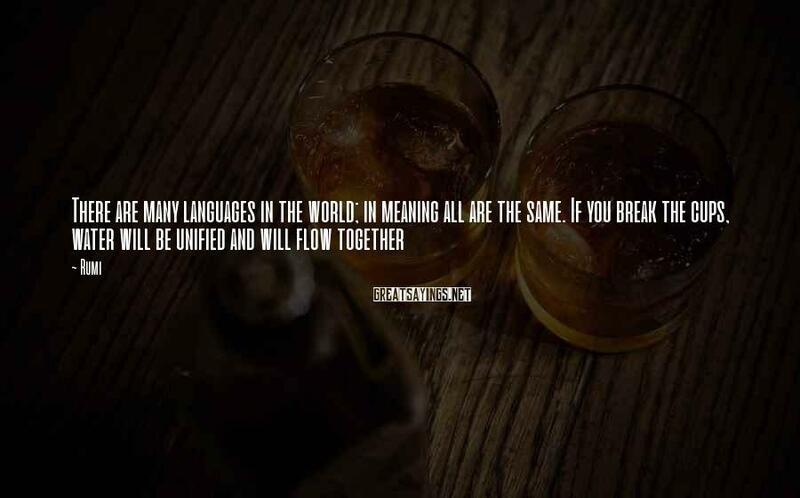 Anyone separated from someone he loves understands what I say. 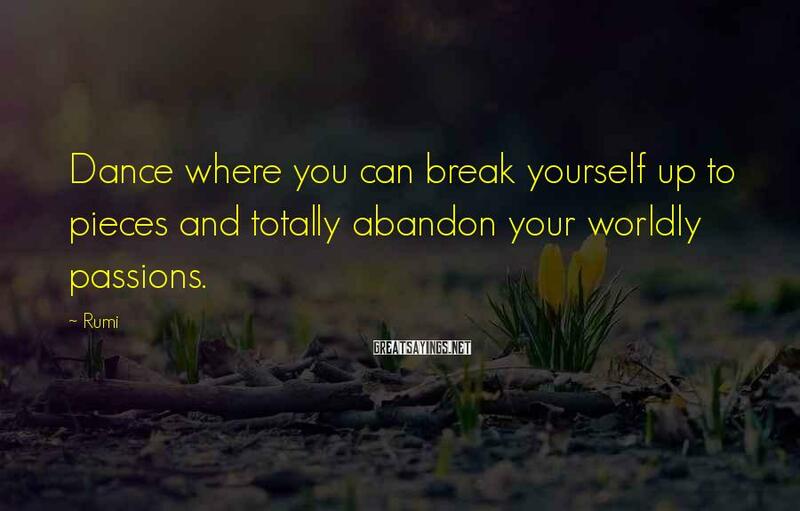 Anyone pulled from a Source longs to go back. 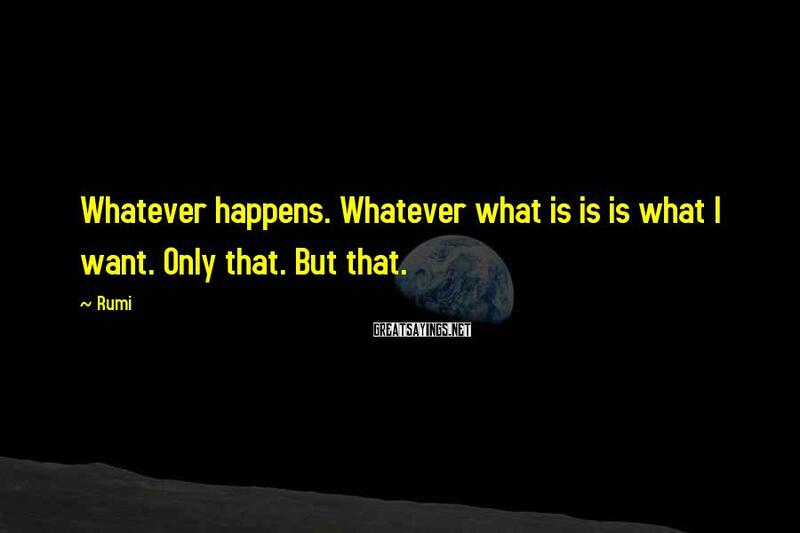 Whatever happens. 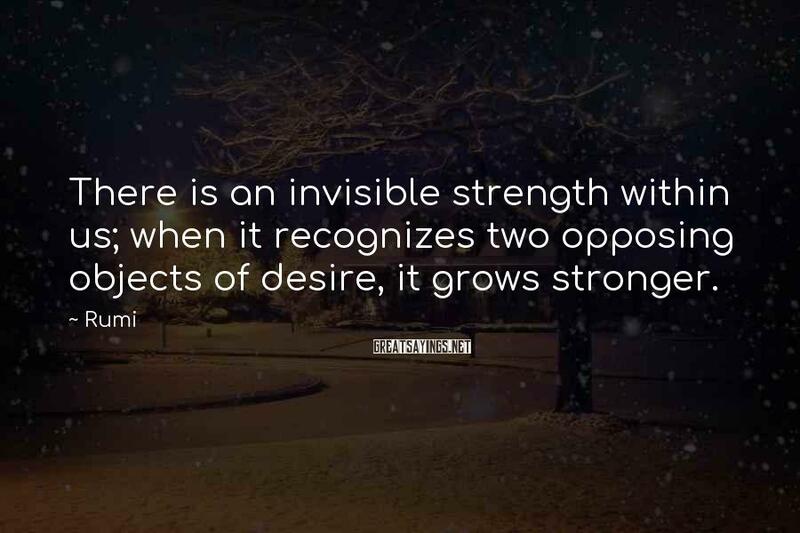 Whatever what is is is what I want. 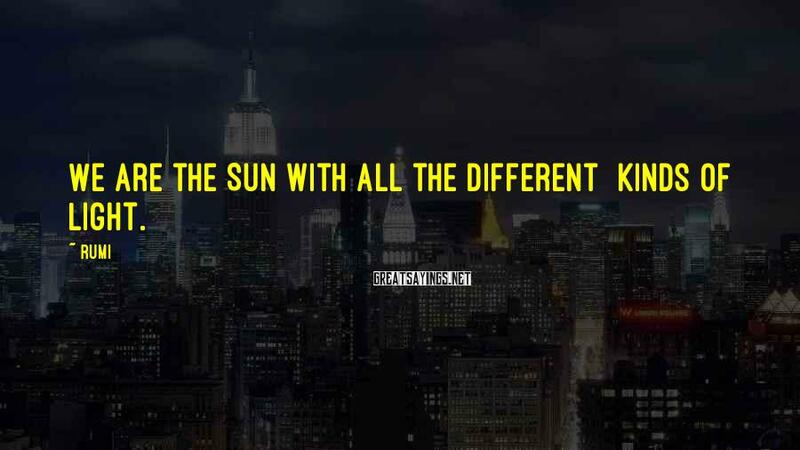 Only that. But that. 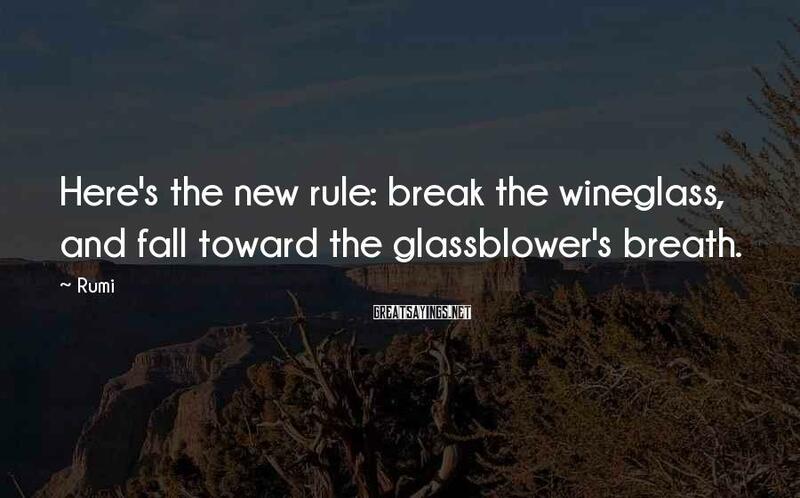 Here's the new rule: break the wineglass, and fall toward the glassblower's breath. 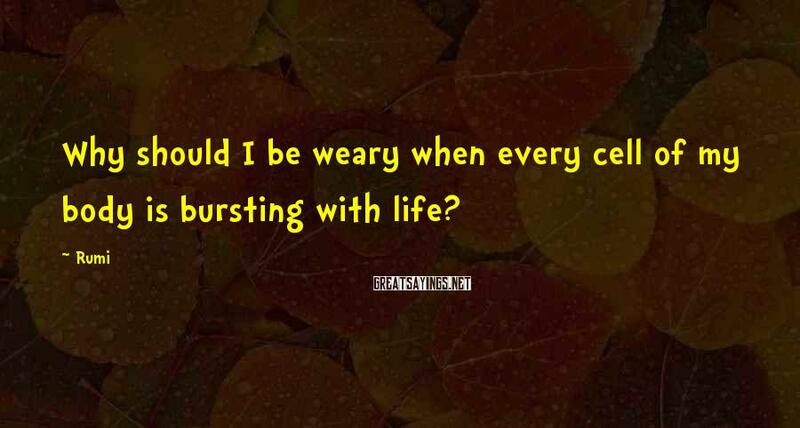 Why should I be weary when every cell of my body is bursting with life? get nothing. He's mocked by passion. 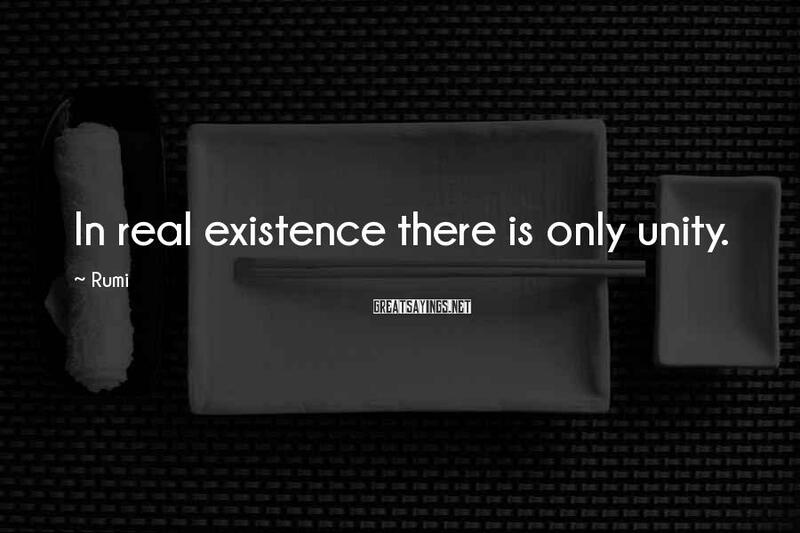 In real existence there is only unity. 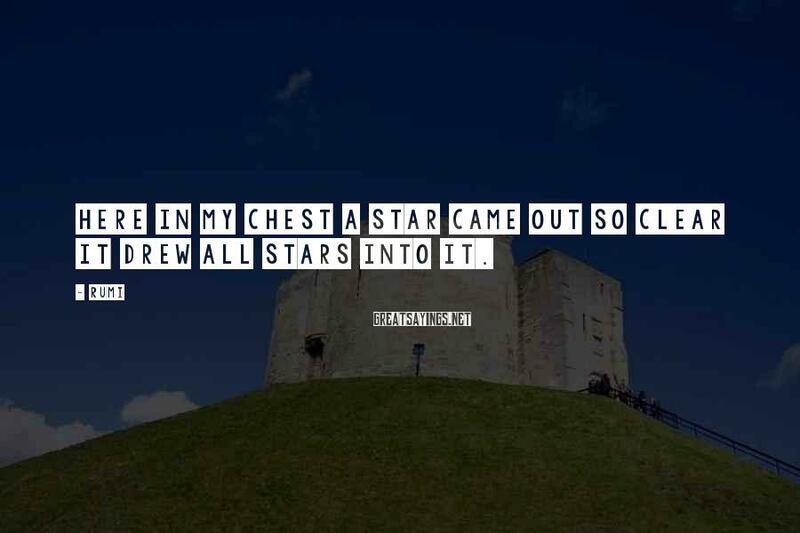 Here in my chest a Star came out so clear it drew all Stars into it. 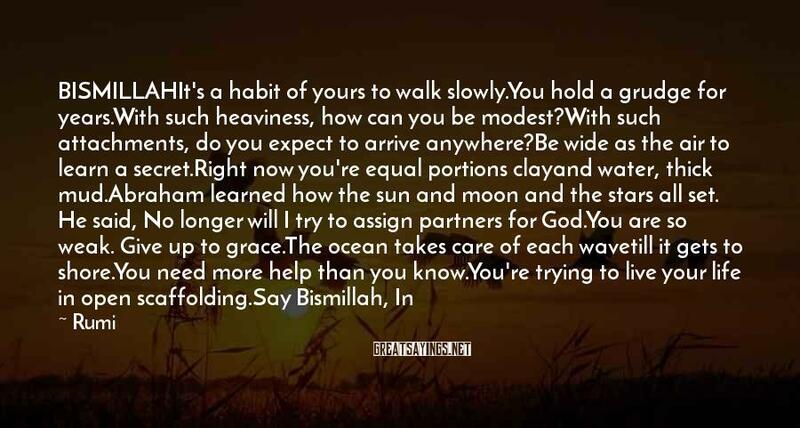 It's a habit of yours to walk slowly. You're trying to live your life in open scaffolding. 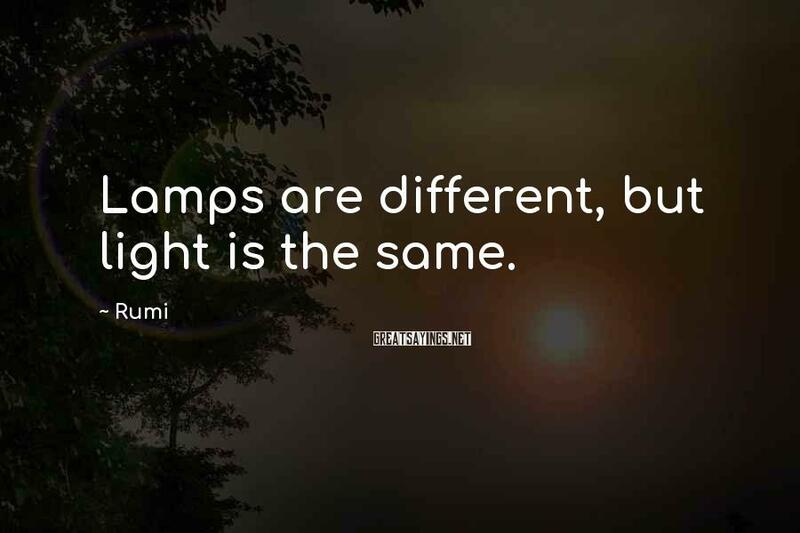 Lamps are different, but light is the same. 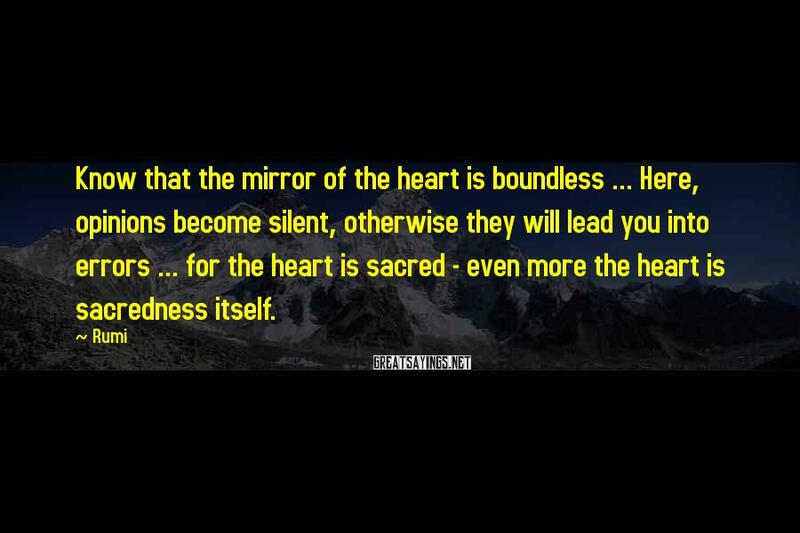 Know that the mirror of the heart is boundless ... 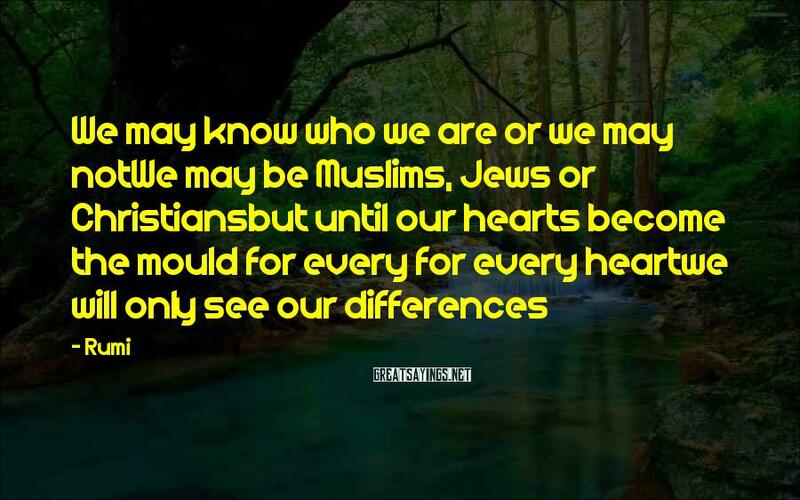 Here, opinions become silent, otherwise they will lead you into errors ... for the heart is sacred - even more the heart is sacredness itself. 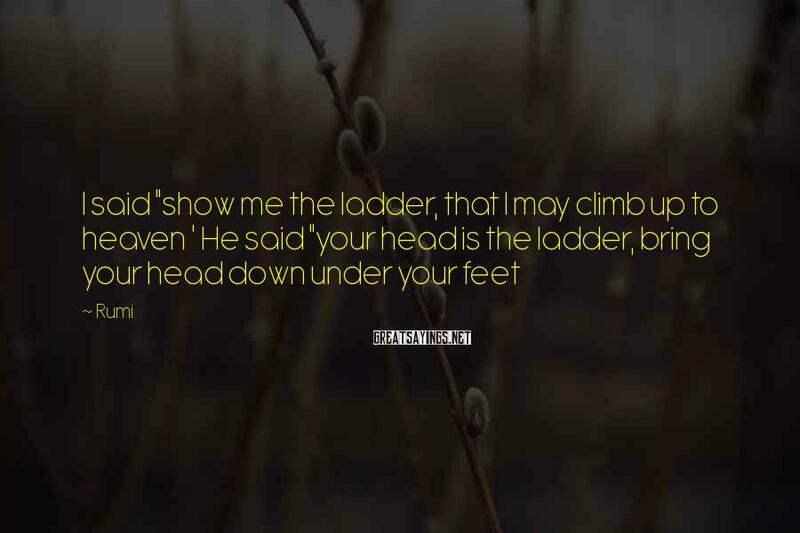 I will pitch my tent in your shadow. 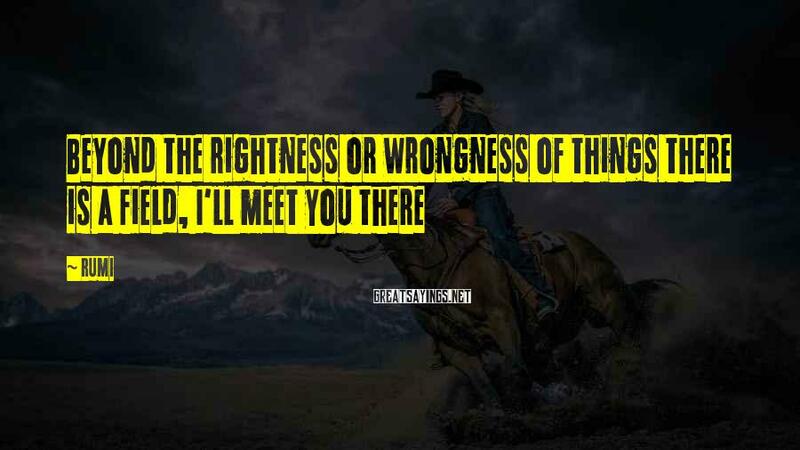 Only your presence revives my withered heart. 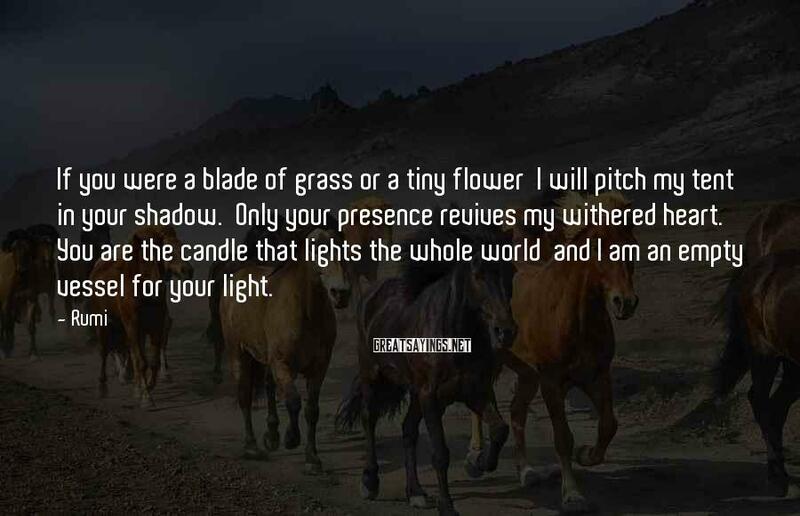 and I am an empty vessel for your light. 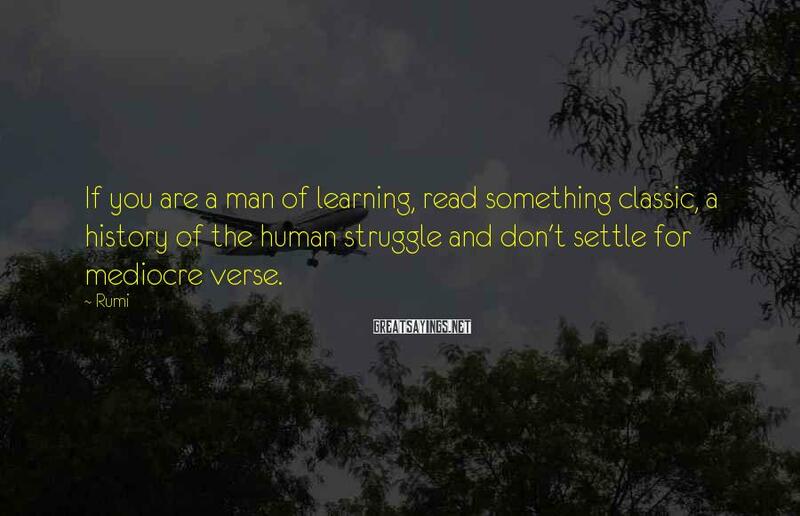 If you are a man of learning, read something classic, a history of the human struggle and don't settle for mediocre verse. There's no need to travel anywhere. 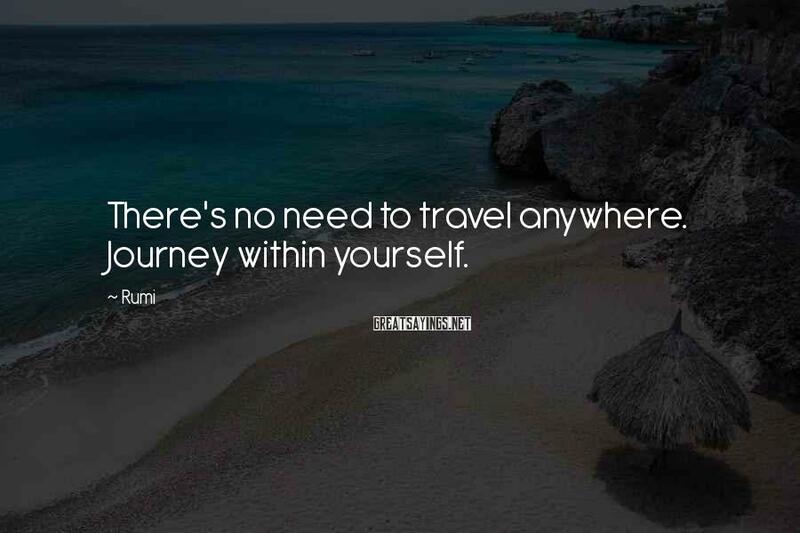 Journey within yourself. word YOU, I mean a hundred universes. 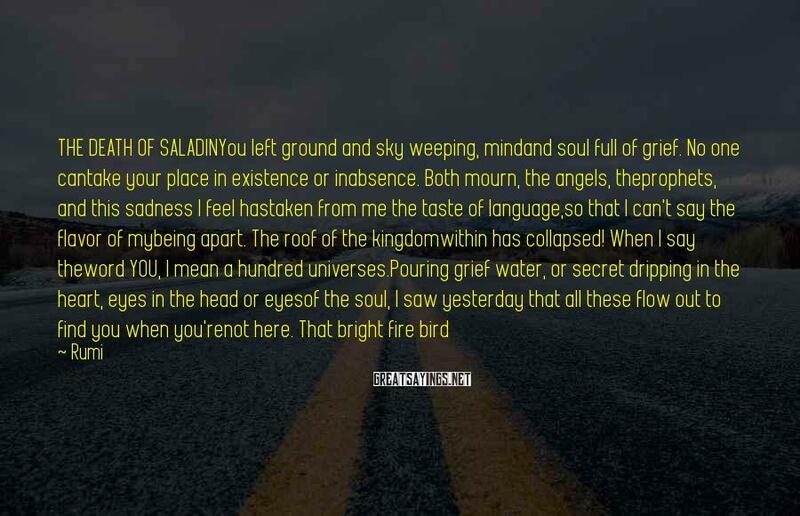 weep for human beings, weep for Saladin. 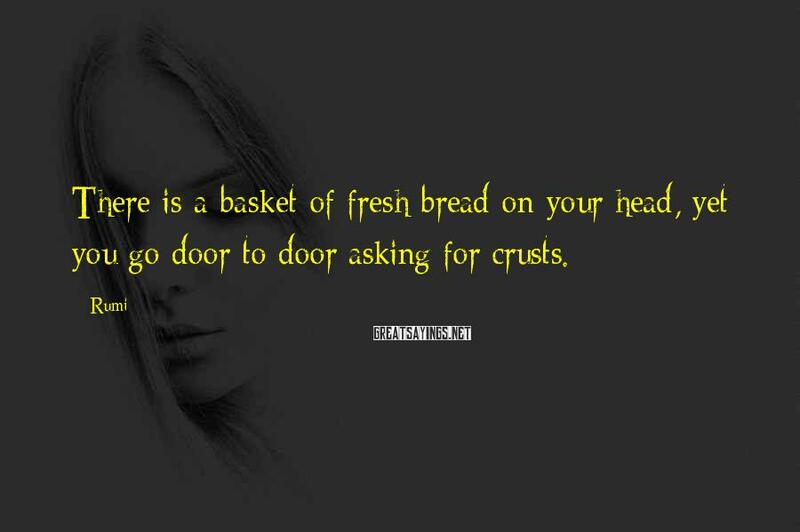 There is a basket of fresh bread on your head, yet you go door to door asking for crusts. 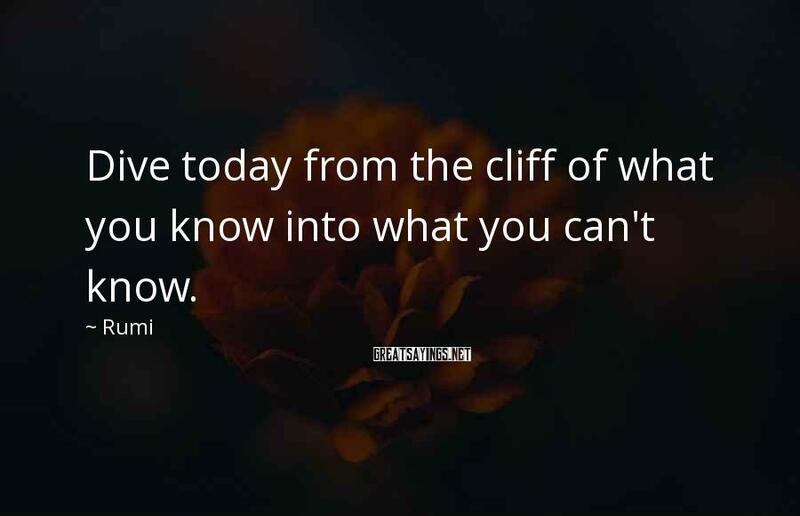 Dive today from the cliff of what you know into what you can't know. 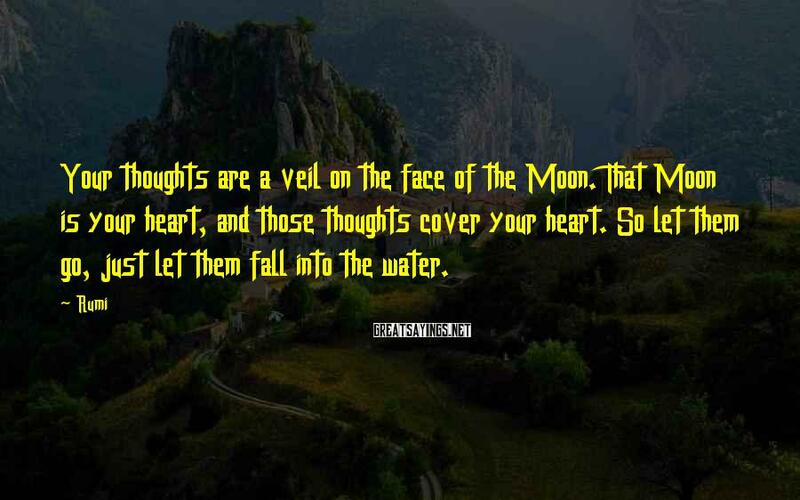 the waterfall and the key, but there is one guiding through all the desiring restlessness. In his mind she lay at his lap with his fingers gliding thru her straight beautiful hair. 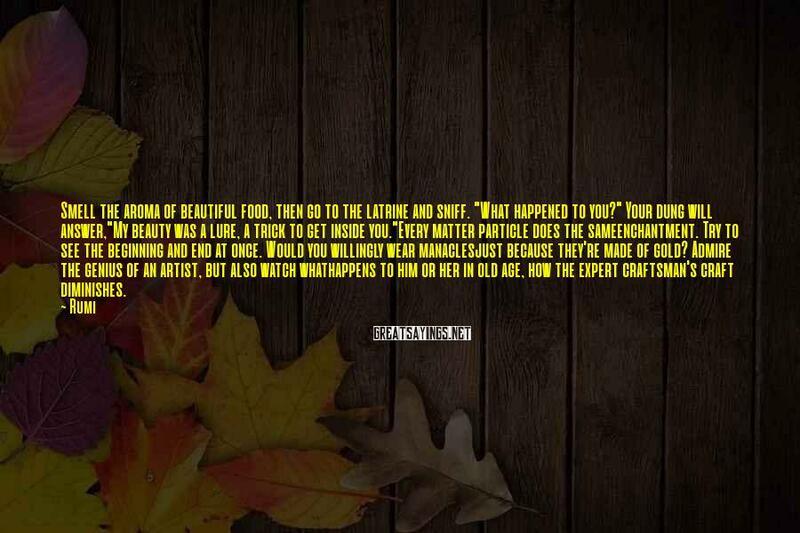 He smiles and says your beauty lights up everything around you. 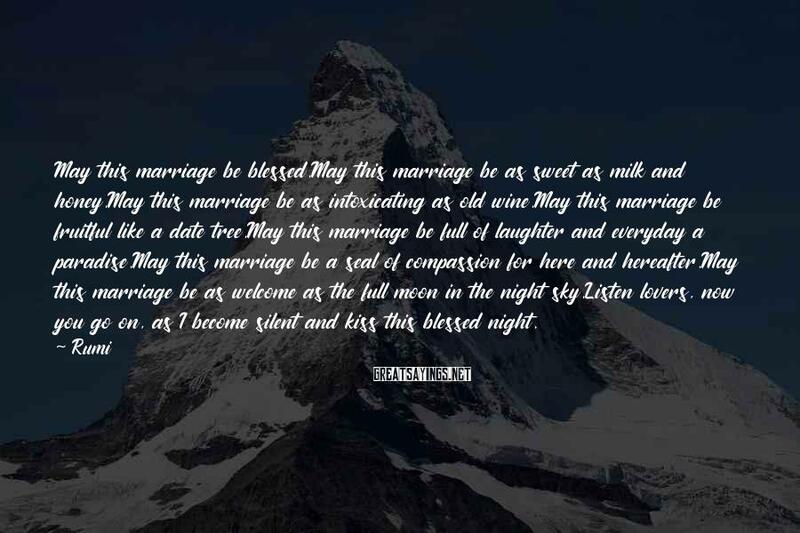 May this marriage be blessed.May this marriage be as sweet as milk and honey.May this marriage be as intoxicating as old wine.May this marriage be fruitful like a date tree.May this marriage be full of laughter and everyday a paradise.May this marriage be a seal of compassion for here and hereafter.May this marriage be as welcome as the full moon in the night sky.Listen lovers, now you go on, as I become silent and kiss this blessed night. 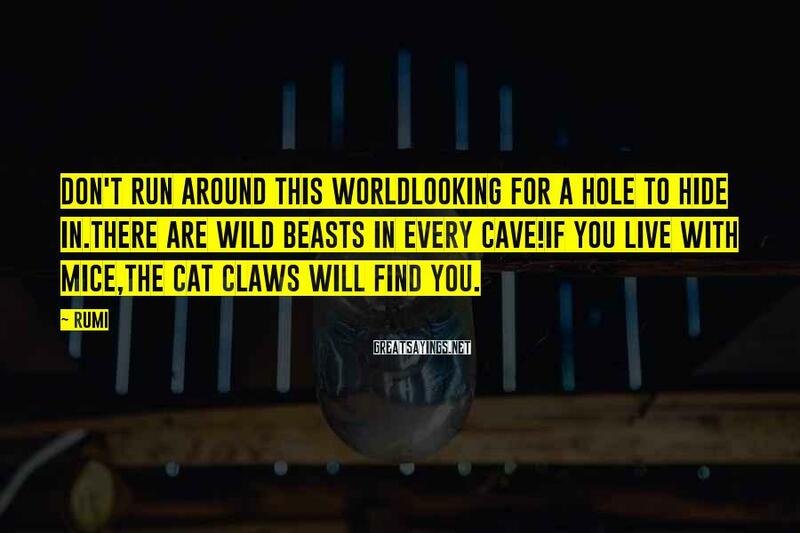 looking for a hole to hide in. "My beauty was a lure, a trick to get inside you." 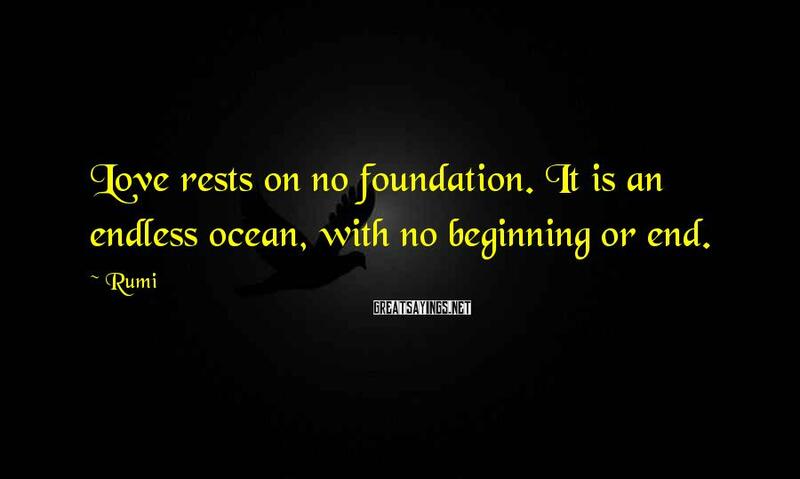 happens to him or her in old age, how the expert craftsman's craft diminishes. 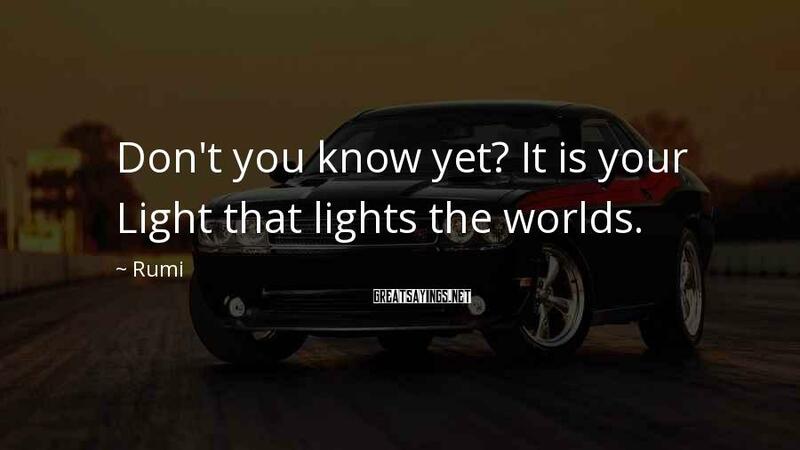 A Light came and kindled a Flame in the depth of my Soul. 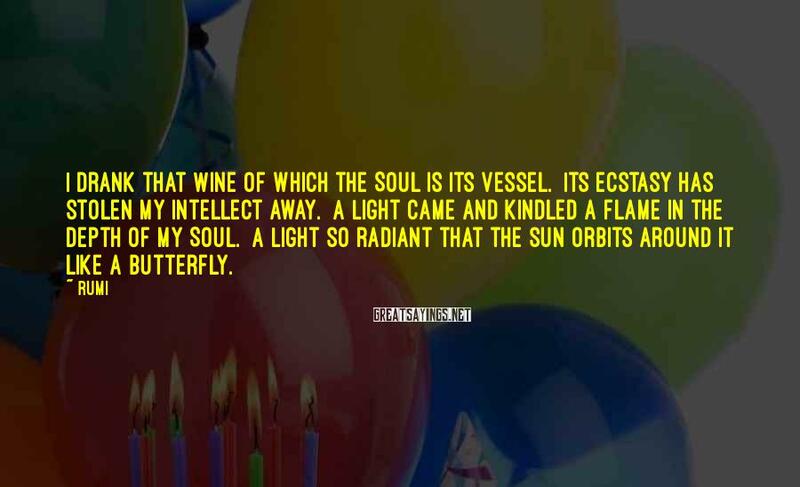 A Light so radiant that the sun orbits around it like a butterfly. 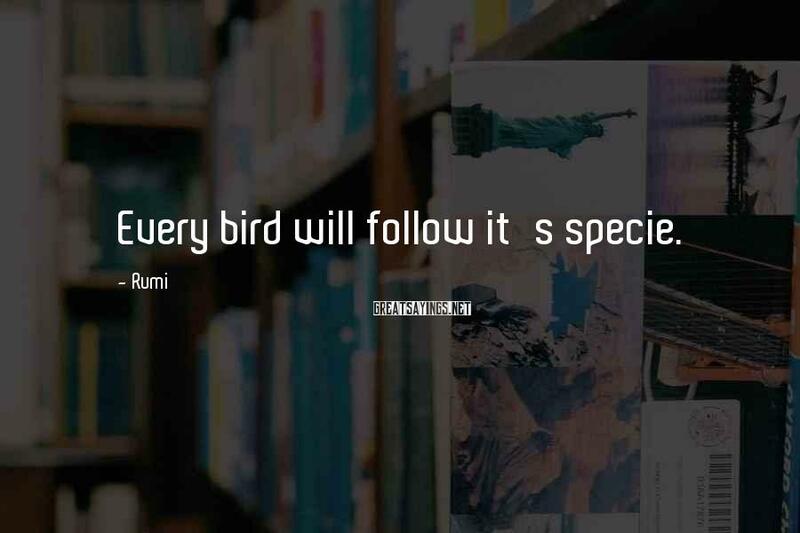 Every bird will follow it's specie. 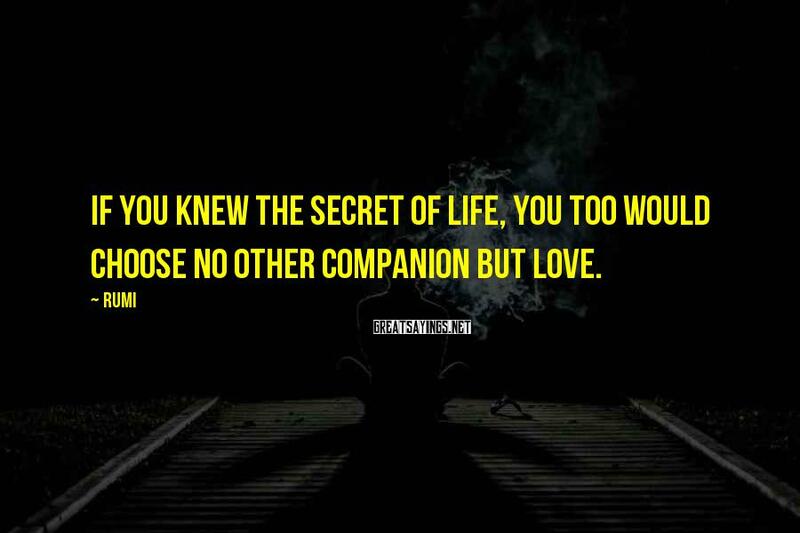 If you knew the secret of life, you too would choose no other companion but love. 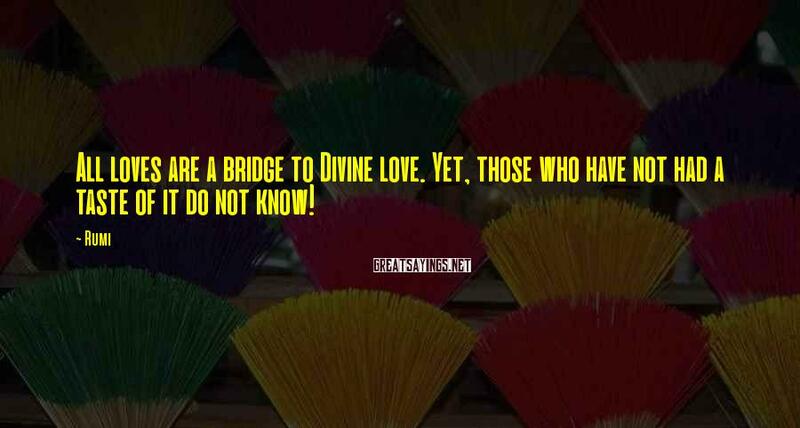 All loves are a bridge to Divine love. 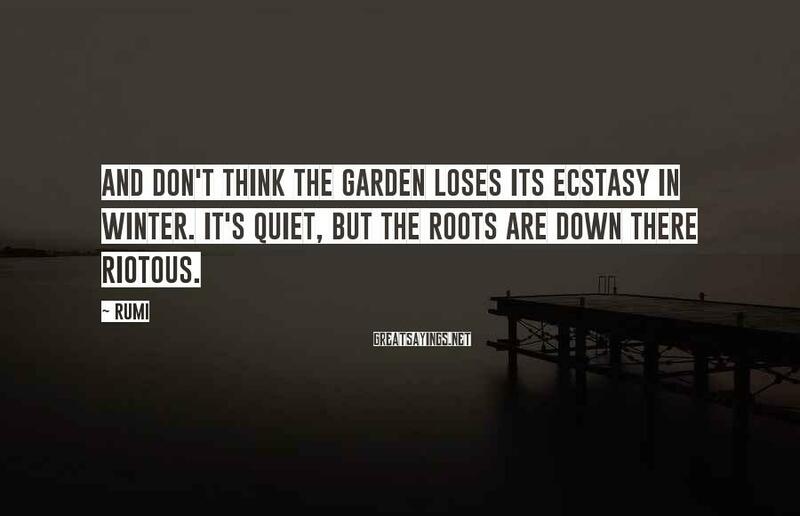 Yet, those who have not had a taste of it do not know! 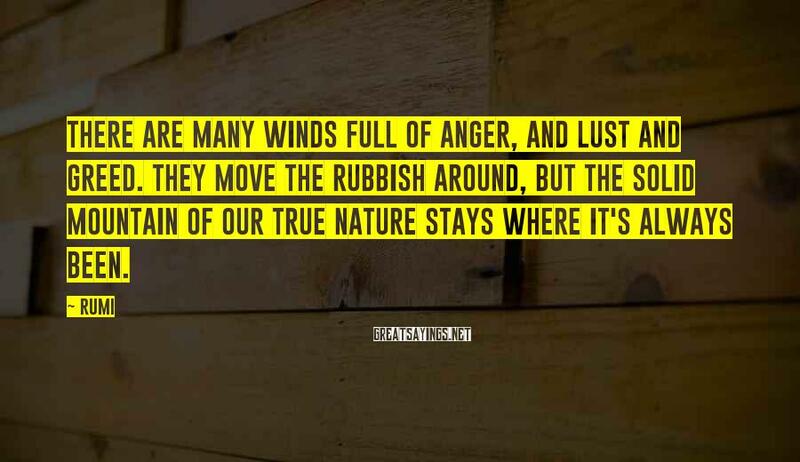 There are many winds full of anger, and lust and greed. They move the rubbish around, but the solid mountain of our true nature stays where it's always been. 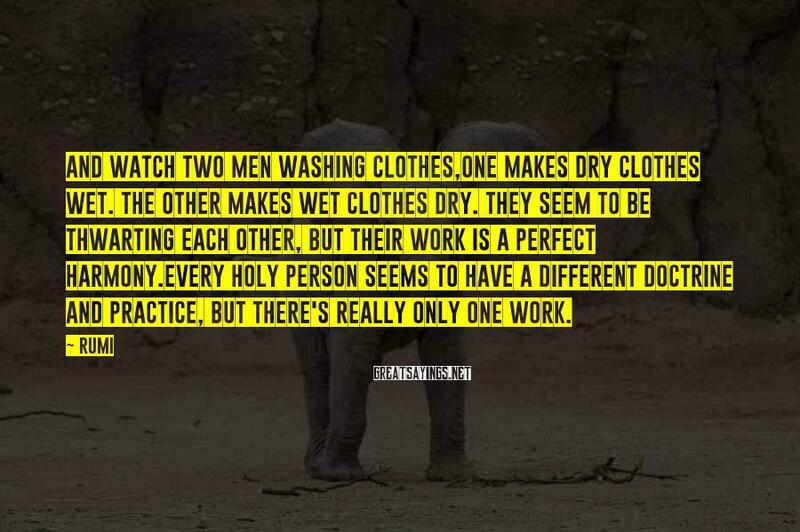 one makes dry clothes wet. The other makes wet clothes dry. they seem to be thwarting each other, but their work is a perfect harmony. 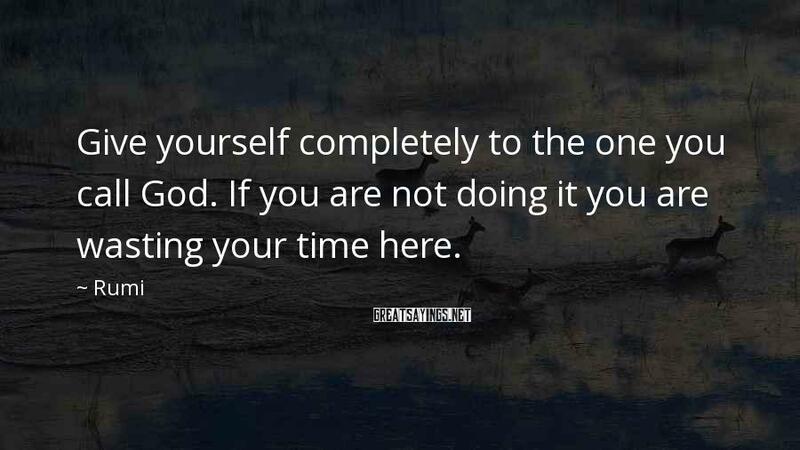 Every holy person seems to have a different doctrine and practice, but there's really only one work. 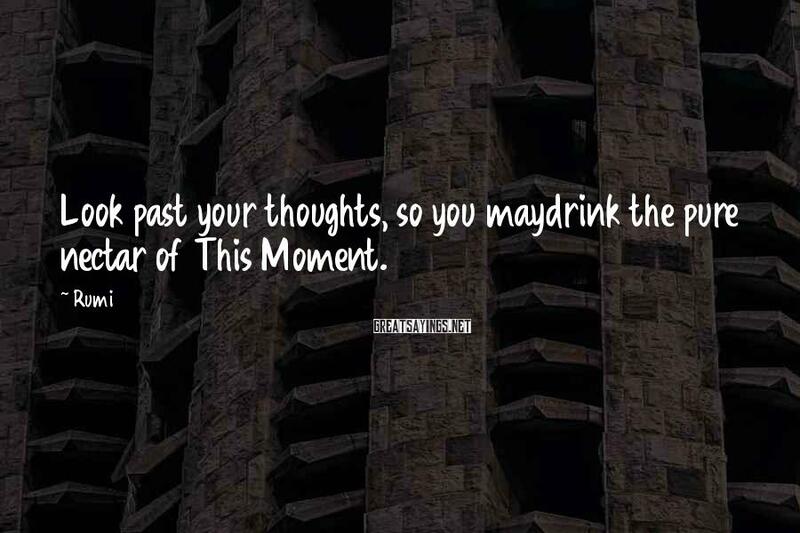 drink the pure nectar of This Moment. 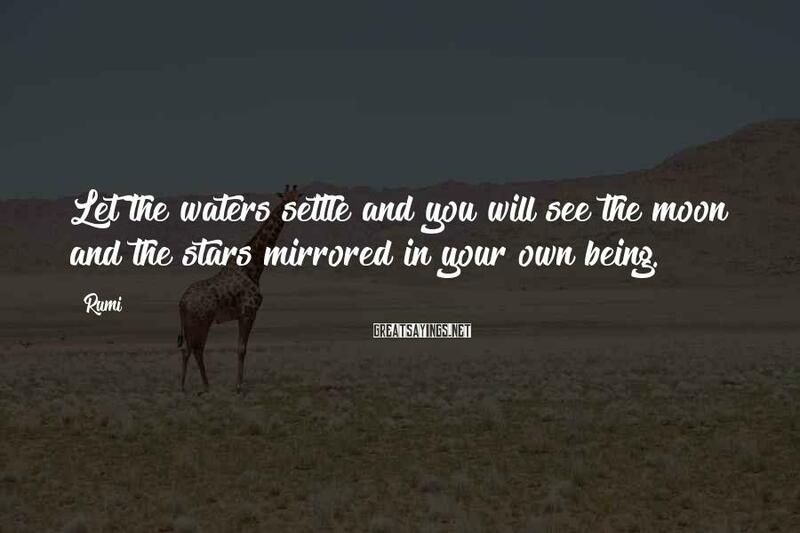 Let the waters settle and you will see the moon and the stars mirrored in your own being. There is a way between voice and presence, where information flows. In disciplined silence it opens; with wandering talk it closes. 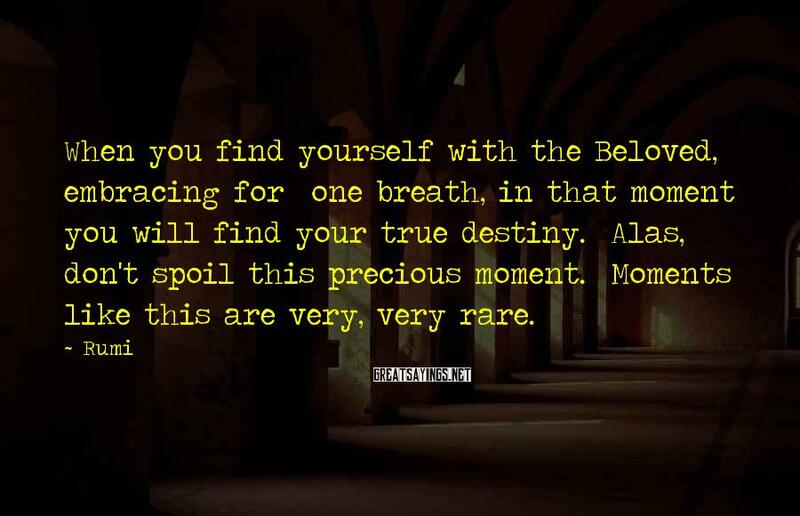 one breath, in that moment you will find your true destiny. Alas, don't spoil this precious moment. 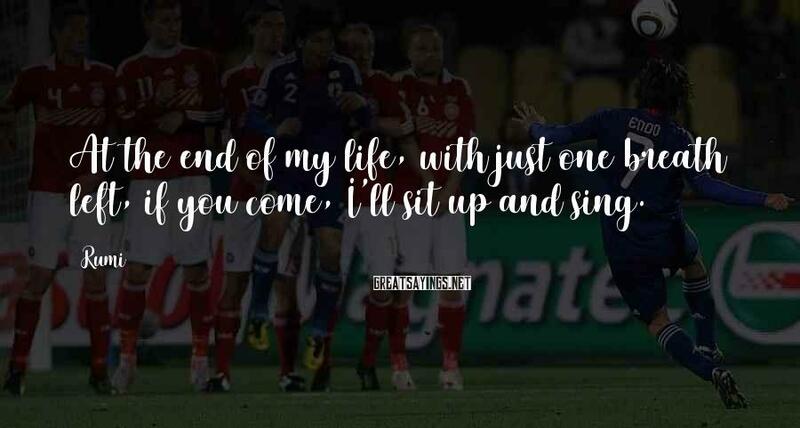 if you come, I'll sit up and sing. 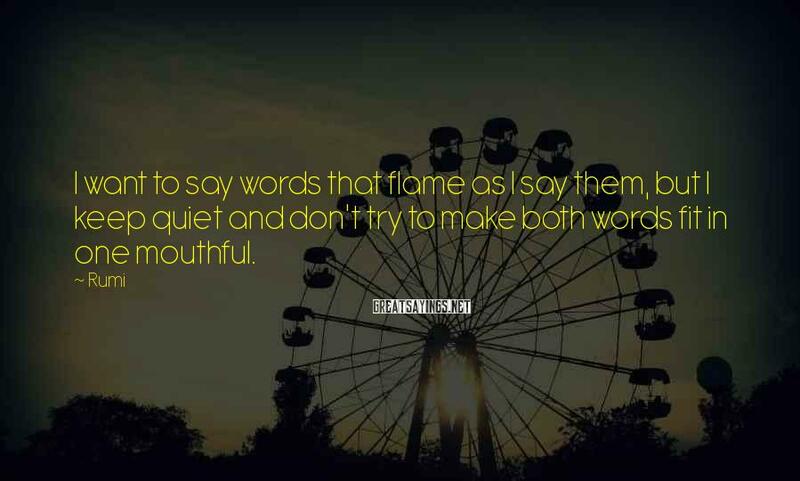 If words come from the heart, they will enter the heart. 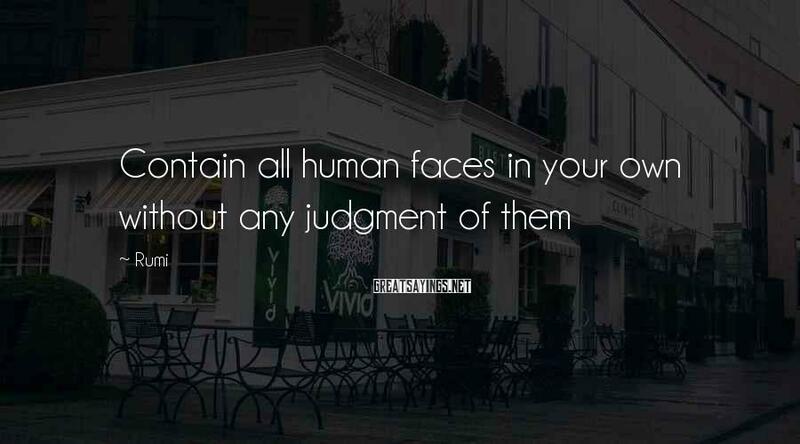 If they come from the tongue, they will not pass beyond the ears. From cane reeds, sugar. 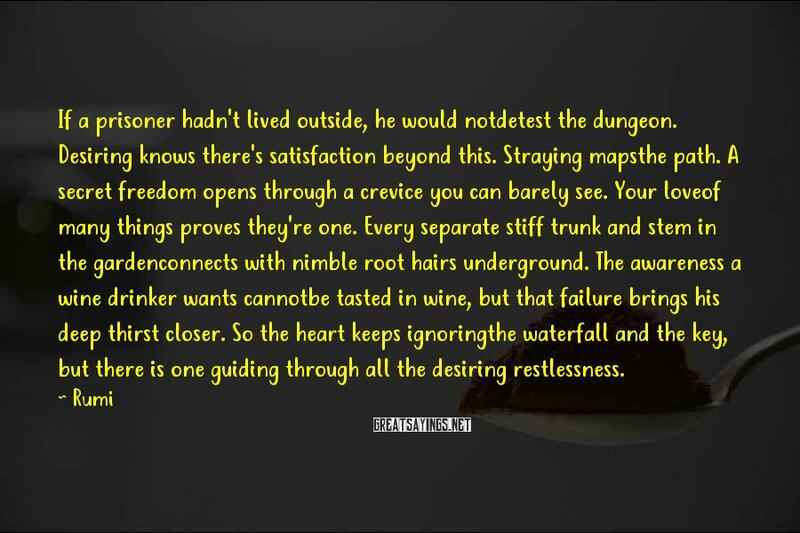 From a worm's cocoon, silk. 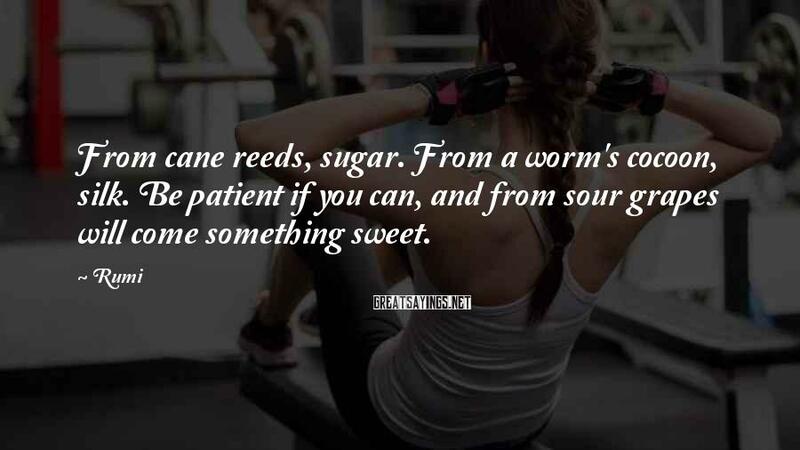 Be patient if you can, and from sour grapes will come something sweet. 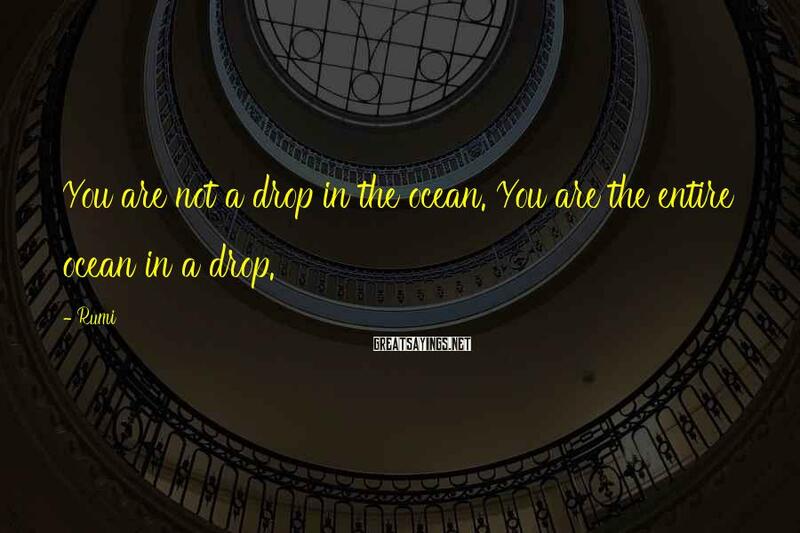 How could you reach the pearl by only looking at the sea? 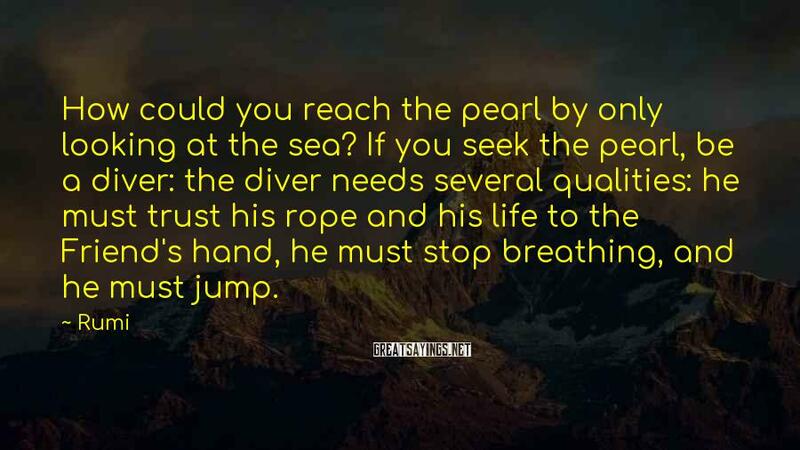 If you seek the pearl, be a diver: the diver needs several qualities: he must trust his rope and his life to the Friend's hand, he must stop breathing, and he must jump. 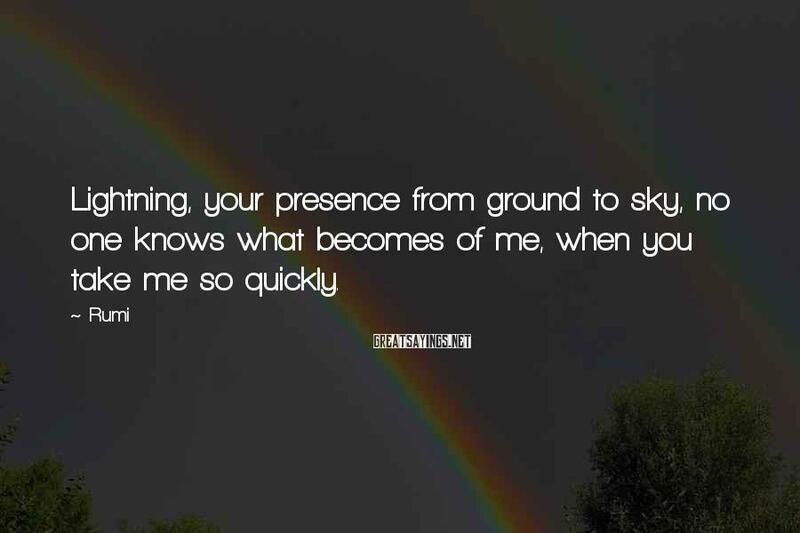 Lightning, your presence from ground to sky, no one knows what becomes of me, when you take me so quickly.